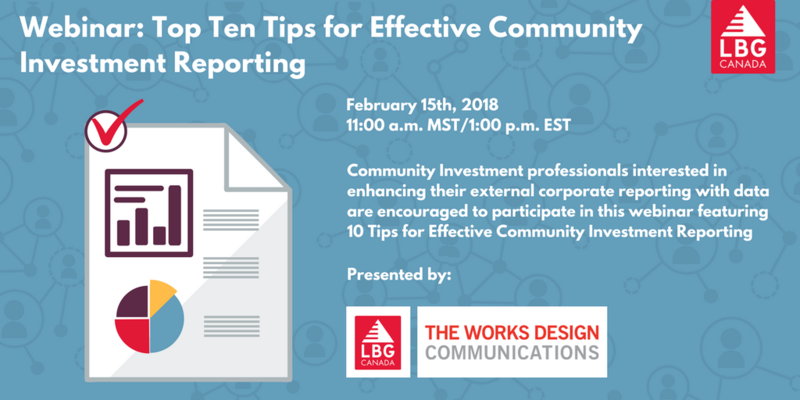 February 5, 2018 /3BL Media/ - London Benchmarking Group (LBG) Canada and The Works Design Communications partner to bring you The Top Ten Tips for Effective Community Investment Reporting. On Thursday, February 15th, 2018 community investment professionals interested in enhancing their external corporate reporting with data are encouraged to attend this web-based discussion. The webinar will include key reporting trends with examples of 'best-in-class' reports backed by the use of salient data. "LBG Canada is a network of top companies leveraging their community investment data to report on impact. We are pleased to partner in the delivery of this webinar with The Works Design Communications, a firm we consider to be a leader in the field of corporate reporting," explains Arundel Gibson, AVP Community Investment & Social Impact, SiMPACT Strategy Group and Facilitator, LBG Canada. GoToMeeting Platform - dial-in details will be e-mailed upon registration. To learn more about LBG Canada, please visit: http://www.lbg-canada.ca. To learn more about The Works Design Communications, please visit: http://www.worksdesign.com. The Works is an integrated communications studio specializing in Corporate Social Responsibility (CSR) consulting and reporting, investor relations communications, branding and collateral development. The Works acts as strategic advisors and candid counsel to Canada's top brands and leading institutions - ensuring that when it comes to communicating with stakeholders, clients are focused on the priorities, metrics, systems and tactics that will enhance their purpose, reputation and performance.